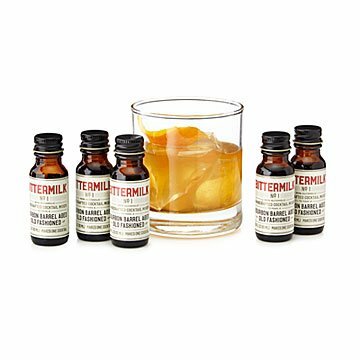 Make perfect Old Fashioned cocktails in seconds with the yummy mix in this set of five single-serve bottles. The Old Fashioned was the very first cocktail, and it's still one of the best. With these single-serve bottles of concentrated mix, you can make a flawless one every time, in seconds no less, even if you're on the go. Add this bourbon barrel-aged blend of golden cane sugar, molasses, bitters, and dried orange peel to a shot of bourbon or rye, and garnish with a fresh orange peel. It just might be the best Old Fashioned you've ever tasted—it was for us, and we've tried them at some fancy (read: expensive) New York speakeasies. Give a set of these pocket-sized mini bottles to your hostess or a frequent flying friend, stuff them in a stocking, or use as party favors. Crafted and bottled by human hands in Charleston, South Carolina. Each 0.5 oz bottle makes one cocktail. I bought this product for my future brother-in-law who is a whiskey aficionado. My bf just happened to get him whiskey for Christmas. It turned out to be the perfect surprise pairing and used it immediately! Not-so-good drink mix was disappointing.